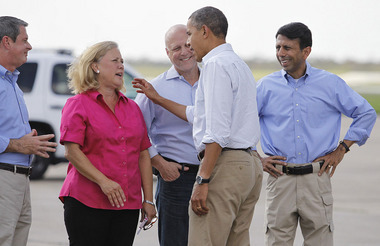 Bobby Jindal: Obama Has Shown "He Is Incapable of Being Commander-in-Chief"
Barack Obama greets former Senator Mary Landrieu (D-LA) and Governor Bobby Jindal during a trip to Louisiana. Governor Bobby Jindal continued his attacks on community organizer and President Barack Obama today in an op-ed at FOX News. Jindal says Obama has shown America he is incapable of being commander-in-chief. President Obama has shown the country that he is incapable of being commander-in-chief of the United States of America. One of the defining military challenges of our time is the spread of radical Islamist terrorism, and President Obama has focused more on criticizing America and lecturing the American people than on devising a plan to hunt down and kill these extremists. Mr. President, the American people are not as dimwitted as you seem to believe we are. We know that most Muslims have no interest in terrorism. It’s an obvious point, but for President Obama and the politically correct crowd, we do need to say it. The American people are not looking to blame peace-loving Muslims for anything, but we also demand a leader who will be honest with us about the threat we are facing from radical Islamic terrorists. We demand a leader who is going to spend less time criticizing America and more time hunting terrorists down and killing them. Radical Islamic terrorists are cutting off people’s heads, killing children, crucifying people, and burning people alive, and we need to find jobs for them? An international jobs program is not a strategy to defeat terrorists. This is madness. Killing the enemy is exactly the way you win a war. More than any other statement, this one demonstrates in broad daylight that the president is not up to the job.